Graylog is a free and open source log management tool based on Java, Elasticsearch and MongoDB that can be used to collect, index and analyze any server log from a centralized location. 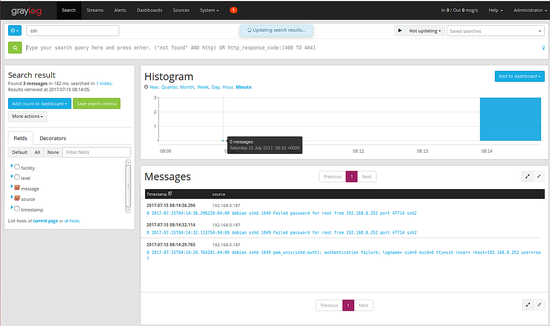 You can easily monitor the SSH logins and unusual activity for debugging applications and logs using Graylog. Graylog provides a powerful query language, alerting abilities, a processing pipeline for data transformation and much more. 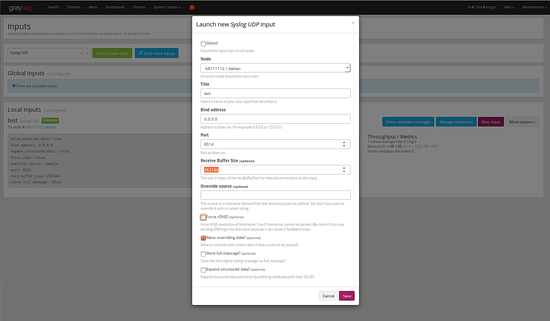 You can extend the functionality of Graylog through a REST API and Add-ons. Elasticsearch : It stores all the incoming messages and provide a searching facility. MongoDB : It is used for database, stores the configurations and meta information. Graylog server : It receives and processes messages from various inputs and provide a web interface for analysis and monitoring. 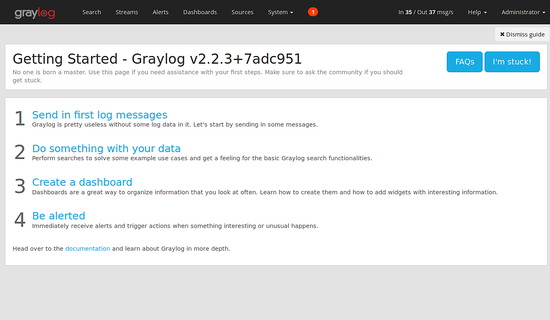 In this tutorial, we will explain how to install Graylog2 on Debian 9 Server. Once all the required packages are installed, you can proceed to install MongoDB. Once MongoDB is installed, you can proceed to install Elasticsearch. Elasticsearch is acts as a search server that stores all the logs sent by the Graylog server and displays the messages whenever you request. Elasticsearch is not available in the Debian 9 default repository. You will need to add the Elasticsearch repository to the Debian package source. Once Elasticsearch is installed and working fine, you can proceed to the next step. After installing Graylog, you will need to set a secret to secure the user passwords and also set a hash (sha256) password for the root user. Note: Remember both password key, because both key will need to configured in the server.conf. You can check the status of UFW firewall any time by running the following command. Once firewall is configured, you can proceed to the next step. 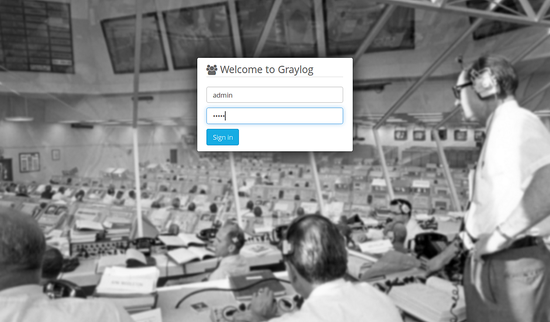 Now the Graylog server will receive the system logs using the port 8514 from the client or server. Next, on the Graylog server click on the "Graylog Sources" you can see the ssh log with failed login attempts in the following screen. Congratulations! you have successfully installed and configured Graylog server on Debian 9. You can now easily see the logs and analysis of the system logs from the central location. You can also customize Graylog and send another type of logs as per your need. 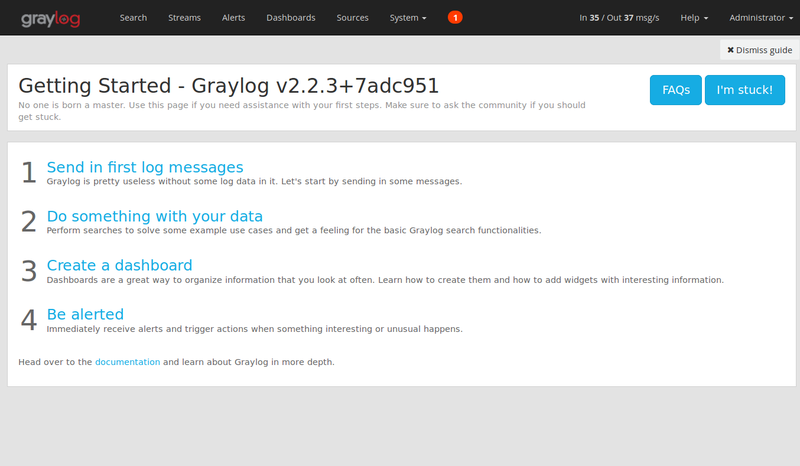 You can get more information from the Graylog documentation page http://docs.graylog.org/en/2.2/pages/getting_started.html. Feel free to comment me if you have any questions. How about MongoDB authentication? Do you think it's OK to allow unauthenticated connections to the database? Maybe mention in the prerequisites a minimum disk capacity. Having followed the procedure on a very minimal specs' VM template, I ajusted to comply to your prerequisites but fell short on disk space within minutes after starting graylog with my 8GB disk. Hi, thanks for the tutorial! Is there another centralized log management system like NXLog https://nxlog.co/products/nxlog-community-edition - which provides high-performance and can even scale to thousands of servers? Some of the items you specifically ask us to set in /etc/graylog/server are commented out, should we uncomment those?